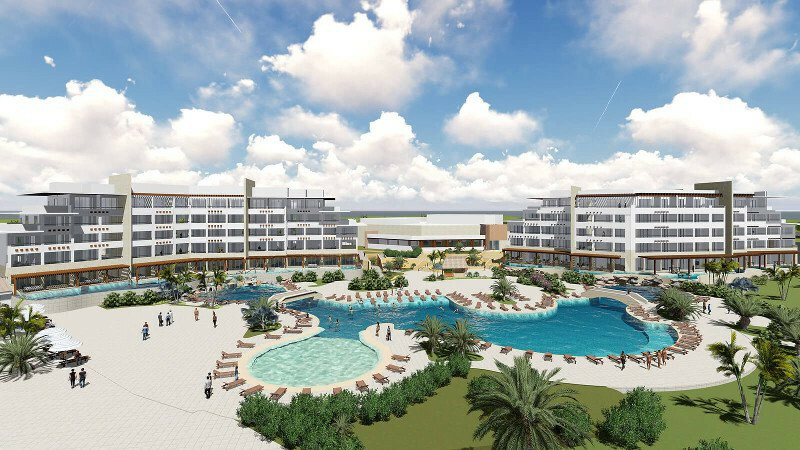 A new all-inclusive property in Cancun is set to open this November with five event venues that can accommodate up to 400 people. Groups, particularly wedding parties, at the new Ventus at Marina El Cid Spa & Beach Resort Cancún Riviera Maya will be able to choose from the El Cid Marina Jetty, an ocean-front gazebo, the Arrecife catamaran, the resort’s beaches, or the convention center salon. The convention center can hold up to 500 guests and is divisible into six breakout rooms, with exclusive group check-in areas and a variety of private, outdoor venues. The seventh property in Mexico for El Cid Resorts, the Ventus at Marina El Cid Spa & Beach Resort Cancún Riviera Maya will be on the coast between Cancún and Playa del Carmen. The beachfront property has 290 luxury suites with private balconies, ranging from 575 to 2,854 sq. ft. Ventus at Marina El Cid Spa & Beach Resort also has an expansive full-service spa, a 2,088 sq. ft fitness center, two infinity pools, a 3,675 sq. ft. main pool with children areas, two adult-only jacuzzis, gourmet eateries, state-of-the-art convention centers and five wedding venue options. The new property has a dozen restaurants and bars, including French fine dining restaurant Île de France; Mercado de Dolores, a market where guests can choose between seven different cuisines including seafood, Italian, Thai, and dessert; Pizzeria II Peccato, serving Italian cuisine; Sea Place, offering fresh seafood; La Crêpe, with sweet and savory crepes; and the Zanza lounge bar between the two main pools with live music in the afternoon. For guests looking to stay in shape, the resort has a brand new fitness center with all basic equipment along with spin classes, TRX training, functional training and yoga classes. The main pool has a dedicated children’s area as well as an adults-only area with two Jacuzzis. There is also an infinity pool that looks over the ocean. Guests will have access to the resort’s sister property’s pools throughout their stay, located next door at Hotel Marina El Cid Spa & Beach Resort. Also available are kayaks, paddle boards, boogie boards, beach volleyball courts, hobie cat rides and wind surfing equipment. When guests are looking to relax, they can head to the spa, which has Temazcal, a Mayan inspired steam bath experience, along with traditional healing remedies and massage techniques as well as ocean-front massage cabanas, hydrotherapy, a steam room and sauna, hair and nail salon, and a boutique featuring Ventus’ signature scent.